This is a long overdue post; but I thought I should still write about our first flight as so many people are nervous about their first flight with baby. I know I was! T was about 7 months old and not crawling yet when we took our first flight together. I hope our experience and my tips will help you prep for that exciting first flight! 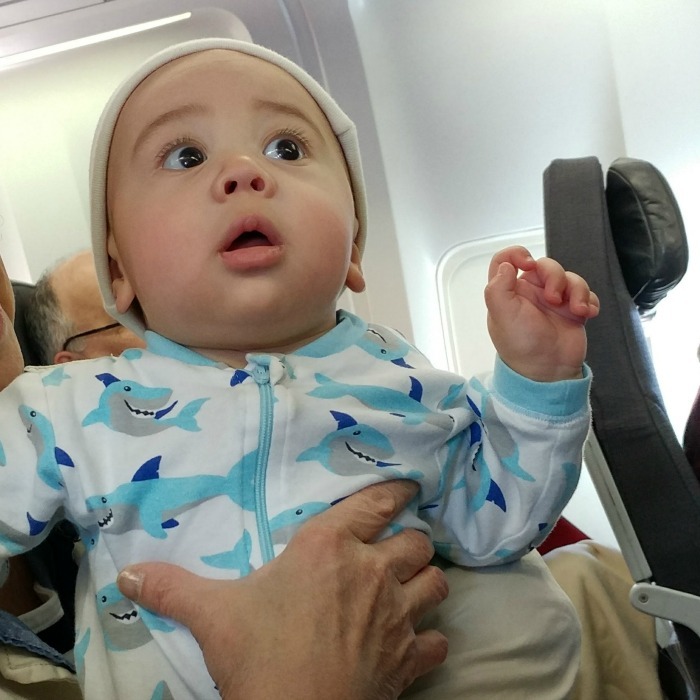 If it’s your very first flight with baby, no doubt you’re feeling a little (or maybe REALLY) nervous about it. I know I was stressed about it – but really excited too! If you have the luxury of choosing your destination for your first flight with baby, do yourself a favour and pick a short flight! I find that when doing anything new with a baby, it’s best to keep everything to a short time frame. My parents have a condo in Florida, so it was a no-brainer for us to head there for the first time! From Toronto it’s only a 2.5 hour flight and flights to Florida are usually filled with other families and older folks that love babies! Hopefully your first flight with baby isn’t by yourself! Having one other adult can be super helpful when flying. Even if you try to pack light you’ll have more stuff than you’re used to carrying plus a little one to look out for. I was lucky and convinced my parents to fly out with me to Florida. They usually like to drive so this was quite different for them – but they were very happy to help us out! 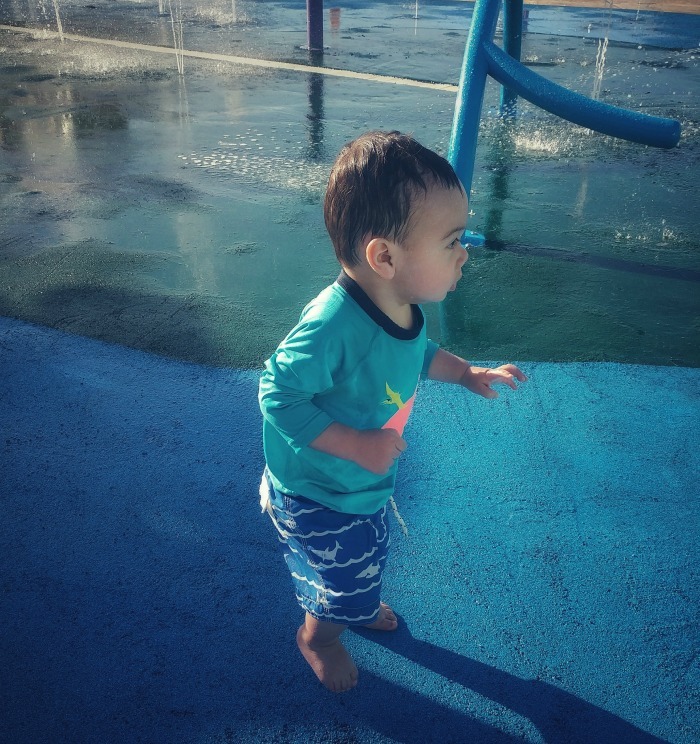 If you have to travel alone with your baby – don’t worry. It’s completely doable. I will be writing a follow up post very soon about flying solo with a baby! If at all possible try to pick a flight that coincides with nap time. 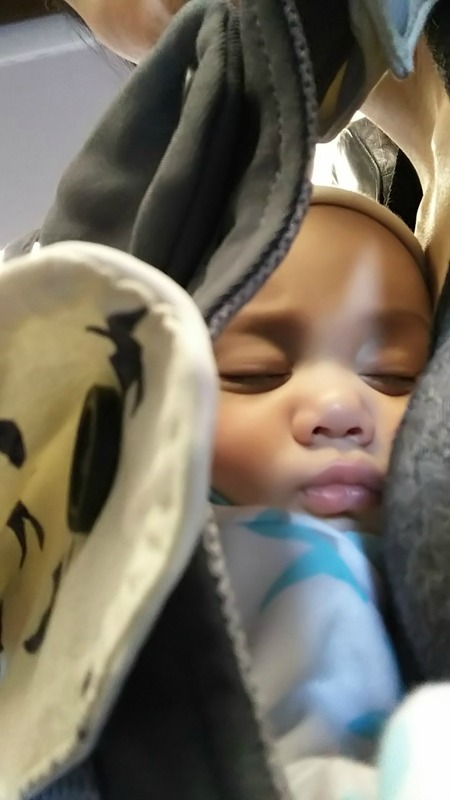 The hope is that your baby will be sleeping during the flight and have his or her nap in the air! Don’t worry if this isn’t possible – sometimes babies STILL don’t sleep on flights even if the timing lines up perfectly. I personally prefer to pick a early flight time going towards my destination so that we have the day to get comfortable with the new environment and still have a normal bed time. On the way back home I’m a little less picky with the flight times. I figure if we get in late, at least all the comforts of home will be waiting for us and your baby will hopefully settle in to home more easily! No matter where you’re heading you’ll likely have some kind of baby gear with you. When we traveled to Florida for the first time, T was still using a bucket style car seat. The car seat snapped easily into the frame of our stroller so I opted to bring my large stroller instead of a travel stroller. I purchased gate check bags for the car seat (J. L. Childress Gate Check Air Travel Bag for Car Seats, Red ) and for the stroller (J. L. Childress Gate Check Air Travel Bag for Standard and Double Strollers, Red ) from amazon. They were well worth it to keep the seat and stroller clean. Extra Tip: You can stuff extra items into the gate check bags that you don’t want to carry on the plane! I stuffed our winter coats, blankets and toys that I used in the airport but didn’t want on the plane. If you’re traveling with a car seat that doesn’t attach to your stroller, most airlines will allow you to check 1 or 2 baby items for free. Call ahead so you know what to expect. If you choose not to bring a car seat but will be renting a car, make sure to confirm a baby car seat rental with the company you’re booking with. Depending on where you’re headed, you may need to bring a pack and play or play pen for your baby to sleep in. Again, check with your airline to see if you can check this item for free. If you’re staying at a hotel, call and see if you can rent a crib from them (some may even provide one for free! ); or consider a company that rents baby equipment so you don’t have to lug around so much gear. T is now 18M and doesn’t really use the baby carrier BUT I still bring mine with me on flights. Carriers are perfect for younger babies since you can wear them at the airport if they are fussy and keep them contained and close to you on the plane. Plus it allows you to be hands free! During your first flight with baby there will be a lot to juggle (passports, boarding passes etc) – even if your baby is being fussy you know they will at least be contained if they refuse the stroller! Bring enough diapers and wipes to get you through the airport, flight, any potential delays and for your first night when you arrive. If your destination has stores readily available, save some suitcase space and just purchase some once you’re there. It’s surprising how much room diapers and wipes can take up! 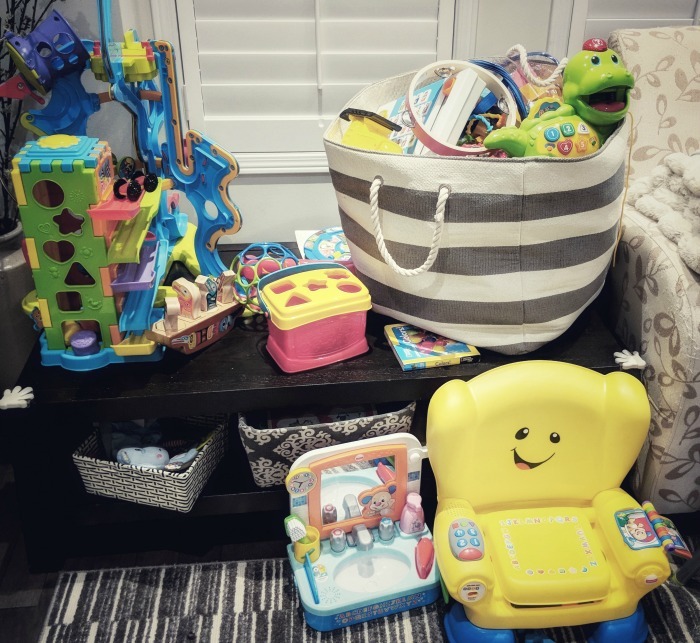 Use my previous tip about the gate check bags – put some diapers and wipes in the gate check bag along with the stroller so you don’t have to carry them all on the plane with you! Be sure have all your documents in order so that your check-in will be smooth. If you haven’t purchased a seat for your baby (under 2 can travel on your lap) they will still need a passport and will receive a boarding pass but it will usually have your name on it (or the adult they are travelling with) and an “infant” code. Check with your airline ahead of time to see if you can check baby items for free. If you’re flying alone be sure to have a note from your partner (if applicable) giving consent of the travel plans. I used the consent letter from the Government of Canada website. To date, I’ve traveled 3 times with T and have only been asked for it once. When you’re traveling with a baby you can bring snacks, water, juice, milk, formula etc for the baby. I’ve only ever been asked if they could test his sippy cups of water. The stroller will have to emptied out and rolled through security on its own to be checked. If you’re carrying your baby in a carrier, it will need to be removed and you’ll have to carry your baby through security in your arms. Since you’ll have to limit the amount your baby moves around on the plane, I always try to let T have some “freedom” at the airport. When he wasn’t walking I used my JJ Cole Outdoor Mat , laid it on the ground at the airport and gave him some toys to crawl after. (Again, I stored the mat in the gate check bag along with the stroller since I didn’t need it on the plane). If you don’t have a mat, then a blanket will work just fine! If your baby is more of a mover, find a gate that’s near yours but with less people and just let them roam around. T loves to watch the planes from the window and climb up and down the empty seats! If you can afford to, I recommend paying extra for the bulk head seats. This offers your much more room for you to move and is helpful if you need to stand up and bounce the baby around for a bit. A carrier is great on the plane to keep baby contained and your hands free. Just note that carriers aren’t allowed during take off and landing. Speaking of take off and landing, I tried to either nurse or have T drink from his sippy cups during these times. I’m not sure if it helped or not, but my hope was that it would prevent his ears from hurting or “popping”. Depending on your baby’s personality, you may need to bring some items to occupy him or her on the plane. It’s a good idea to bring some small but new toys that you can take out of your bag when they start to get fussy. Snacks are always good to have on hand too! Usually for your baby’s first flight there is so much for them to look at on the plane, they will hopefully be easily entertained! 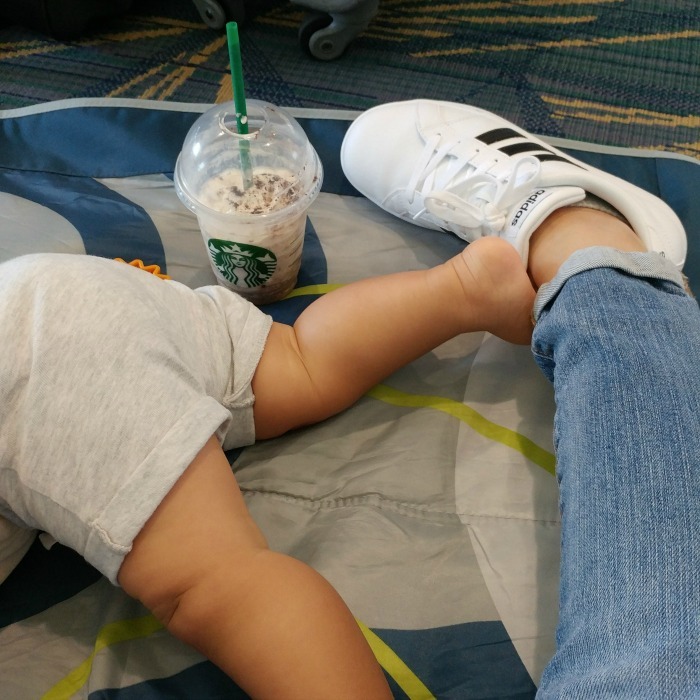 Airport necessities – mat for baby and coffee for mama! Traveling with a baby is definitely different than traveling alone! It does require more planning up front but it’s really important to be patient, give yourself A LOT of extra time (especially for your first flight with baby) and try not to stress. 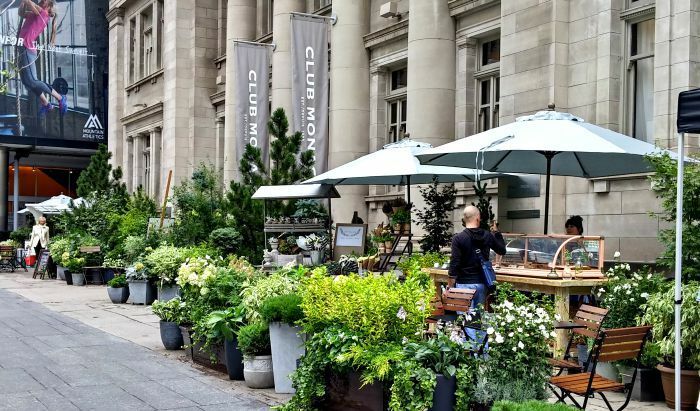 For the most part, people are really accommodating and understanding. And for those that aren’t – well that’s their issue. They are adults and should be able to control their feelings and actions while babies and children can’t. So just ignore them! I was anxious the first time I had to fly with T, but we’ve been on several trips now, and it’s gotten so much easier. And traveling with your baby is SO much fun! You actually notice a lot more of your environment and appreciate the little things since you’re experiencing it all through their eyes! 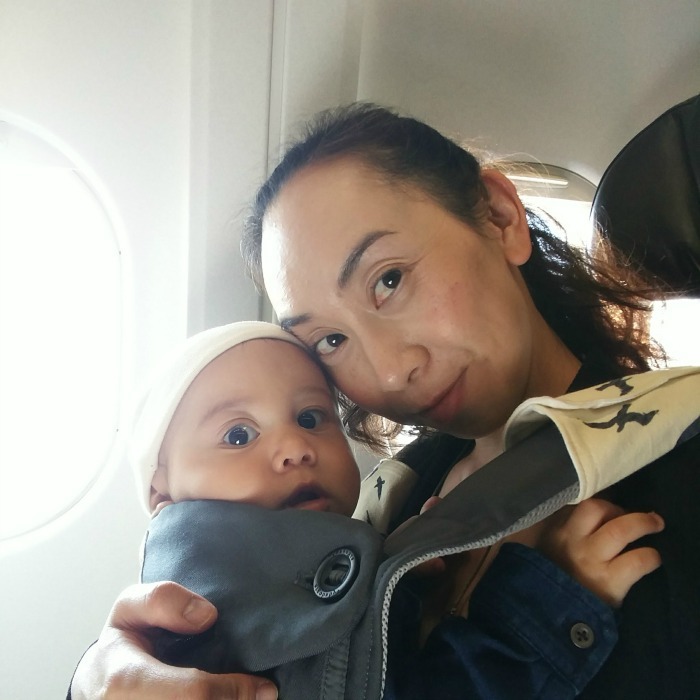 I hope these tips helped and enjoy your very first flight with baby! I loved this post! So informative and it answered a few questions that were bothering me! While our flight will be 5 hours instead of 2.5 I’ll be equipped with some knowledge to make it as smooth as possible. Thank you! Thanks Joanna! If you have any other questions don’t hesitate to ask 🙂 You guys will have a great time!